Server-based virtual desktop infrastructure holds the promise of giving organizations a simpler way of managing PCs, still one of the IT professional’s most laborious duties. While reliability has held back adoption, VDI technology is maturing—as well as becoming both less costly and less complicated to deploy. Vendors and advocates say performance is not the sticking point it once was. 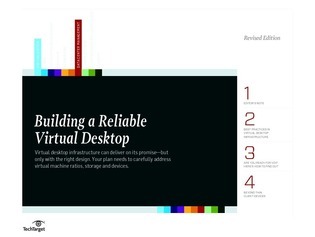 This handbook explores the best practices for achieving reliable VDI performance, including how to prepare a network for a heavier load, capitalize on VDI’s security benefits, create an effective storage architecture and handle applications. AMD, the AMD Arrow logo, AMD Radeon, and combinations thereof, are trademarks of AMD. Please note: Upon submission of this below form, you will receive follow-up communication from an HP representative in regards to this registration. If you wish to view HP’s full privacy statement & to learn how automatic data collection tools personalize your experience, please click here.